Karina's Kreations: Balloon Bash Sneak Peak! I'm sharing a Balloon Bash sneak peak with you today. I love the fun sentiments that come with this set. 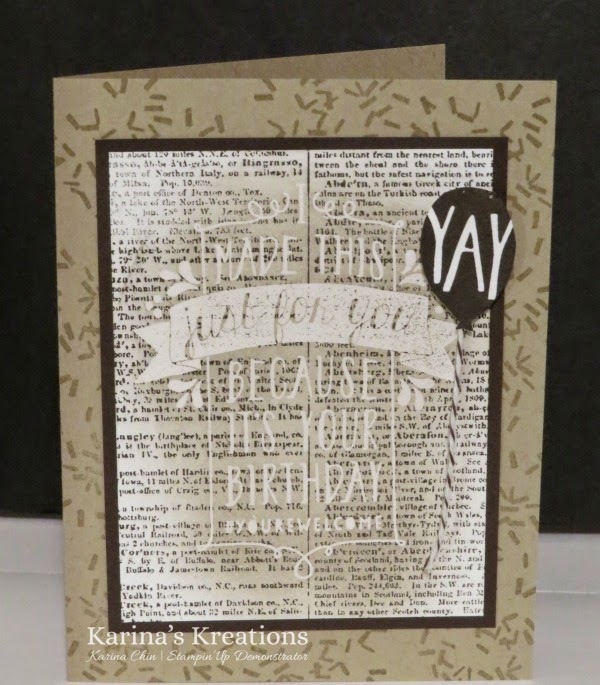 I stamped my greeting with versamark ink and embossed it with clear embossing powder on Whisper White card stock. I stamped the Dictionary stamp with Early Espresso ink right over top of the image. I sponged Crumb Cake ink over the greeting and the image appeared. It's an emboss resist technique. The balloon was stamped with Early Espresso ink and cut out with Paper Snips. You can buy this set on Jan 6th!